Your number one team for all your tree trimming, tree removal and landscaping needs. Give us a call today at 806-472-4446. We want to help you today! Call us today for all your tree trimming and landscaping needs. Call us today for your free estimate at: 806-472-4446. Need Emergency Tree Services call today at 806-472-4446. Need More Than Just Tree Trimming? Landscaping: We not only handle your tree trimming and removal, we also specialize in all your landscaping needs. We have over 50 yards we manage in Lubbock, Texas and surrounding areas. We can handle all your gardening and landscaping needs. Trust us for your Landscaping and Lawn Maintenance. We can even handle all of your Fertilizing, Grass Seeding, and Sodding needs. Fall and Winter Help: While trees can be a beautiful addition to any yard, the clean up of the leaf clean up can be such a pain. Let us help you make it a painless process. Winter mess can also cause a mess to clean up as well. We don't get much snow and ice in Lubbock, but when we do let us handle your snow removal and ice clean up. Christmas Light Installation is a beautiful attraction. However, many don't have the knowledge, capabaility, or know how to install their beautiful light creations. Call us for your Christmas light installation. We are more than just a tree trimming company. We can do so much more. Check out our full list of services below. 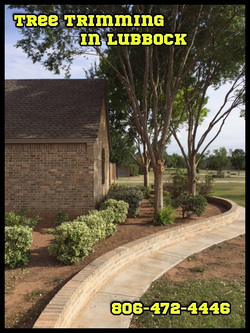 Call us today to see how we can best serve you at Tree Trimming Lubbock call 806-472-4446.